Google Page Creator is awesome - anyone can build a good looking website in minutes using the built-in templates or they can write pages externally (say in Dreamweaver) and upload them to Creator. And everything is free - there are no ads on your pages and Google takes care of all the web hosting bills. But as they say, all good things come to an end, and so is Google Page Creator getting replaced by Google Sites. While Google Sites and Google Pages have common feature (like the WYSIWYG AJAX editor), they are still quite different. For instance, you can�t upload HTML pages to Google Sites and are therefore limited to using one of the built-in themes for your site design. The second issue is that if you make a Google Site public, the associated �site activity log� also becomes public - most website publisher will have reservations sharing this data with unknown visitors. Lastly, all external hyperlinks are �nofollow� if that means anything to you. Here�s a roundup of some website building services that are free and non-technical. 1. Office Live Small Business - While the name may suggest that the service is only for small business owners, just about anyone can create their website here. 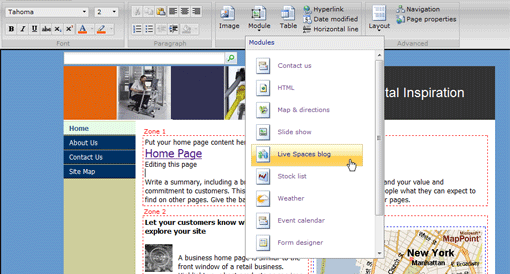 Office Live is easy and filled with goodies - you have tons of professional web templates and color themes to choose from, there�re ready-made modules for common tasks like web forms, photo galleries, live maps,� email newsletters, etc. plus you can also upload office documents to the website. 2. Weebly - This is powerful but very user friendly and easy web page builder where you start with a blank canvas and build the page by dragging elements that include text, videos, pictures, maps and more. Geeks can write their own HTML and add them to Weebly pages. There�s support for Google ads as well so you can even monetize sites created inside Weebly. Another advantage - site publishers download their full site with pictures and CSS as a zip file. Free users gets 100 MB of free storage space and there�re no bandwidth limitations. See sample site. 3. Snap Pages - This is Flash based website editor that is very beautiful and may be a perfect place if you looking to create a small website for sharing some photos and your calendar. The options are slightly limited for non-premium users as they can�t create new pages. See sample site. 4. Edicy Pages - It�s a new website creation tool that is just perfect for the techie crowd who wants more control over their site layout. 5. Synthasite - This is again an easy yet very powerful tool for building websites but unlike competition, Syntasite is completely free. Images uploaded to Synthasite can be diretly edited in Picnik just like you have in Flickr. The tool also lets you embed Google AdSense ads in web pages much like Weebly. See example site.